Keepers at The Aspinall Foundation's Port Lympne Wild Animal Park near Ashford, Kent provide some early Halloween themed enrichment for some of the primates. Primate keepers at Port Lympne Wild Animal Park, near Ashford, got into the spirit of Halloween a little early this year when they provided some unusual enrichment for some of the primates at the park – involving broomsticks. 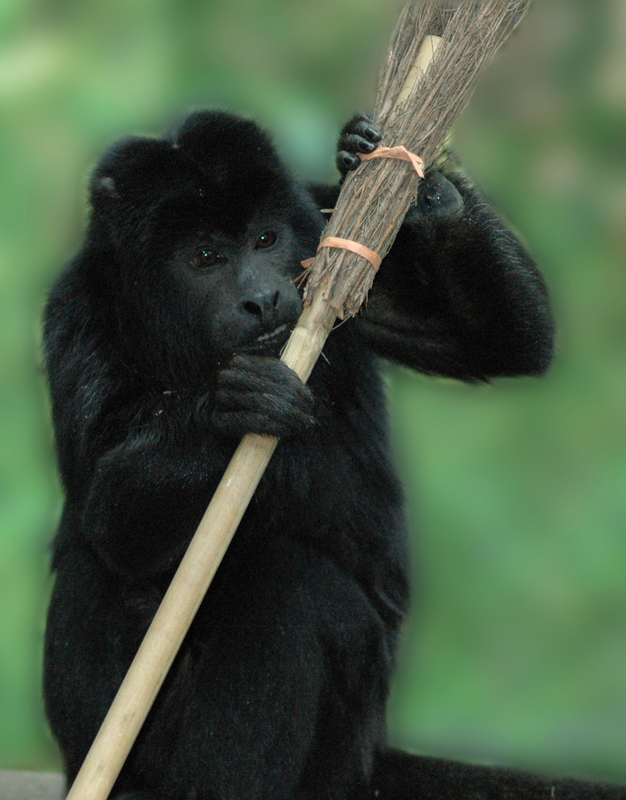 The broomsticks, made from bamboo and natural brush, were given to the primates with treats such as nuts and fruits hidden in the brush and in the end of the stick. Visitors to Port Lympne Wild Animal Park this Halloween half term will be able to watch various forms of themed animal enrichment and even take part in pumpkin carving to win goody bags, filled with treats. The Aspinall Foundation’s Port Lympne and Howletts Wild Animal Parks in Kent were set up by the late John Aspinall to be centres of excellence for animal husbandry within which to protect and breed threatened species, with a view to returning them to the wild wherever possible. The Aspinall Foundation is a world leading conservation charity dedicated to keeping John Aspinall’s innovative conservation ethos alive leading the way through education, captive breeding and reintroduction. The Aspinall Foundation has projects both in the UK and overseas, including Java, Madagascar, Congo and The Gabon. Working in conjunction with the parks, The Aspinall Foundation has so far returned to the wild Przewalski's horses, black rhino, Cape buffalo, Burmese pythons and western lowland gorillas. Port Lympne and Howletts Wild Animal Parks were awarded Best Leisure and Tourism Business in Kent at the 2012 KEiBA awards.